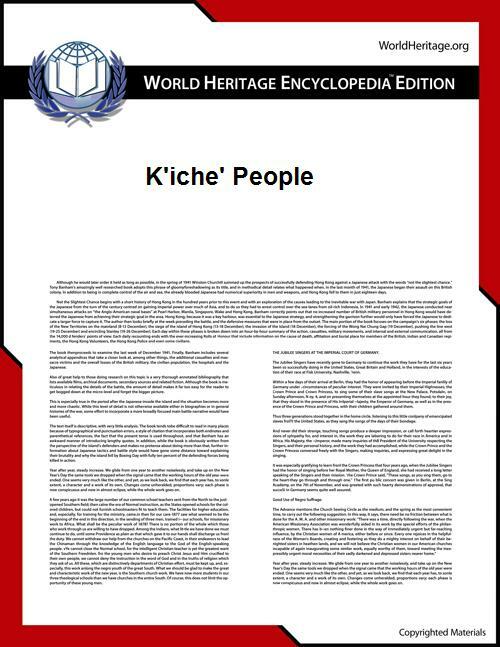 K'iche' (pronounced ; previous Spanish spelling: Quiché) are indigenous peoples of the Americas, one of the Maya peoples. The K'iche' language is a Mesoamerican language in the Mayan language family. The highland K'iche' states in the pre-Columbian era are associated with the ancient Maya civilization, and reached the peak of their power and influence during the Postclassic period. The meaning of the word K'iche' is "many trees." The Nahuatl translation, Cuauhtēmallān "Place of the Many Trees (People)", is the origin of the word Guatemala. Quiché Department is also named for them. Rigoberta Menchú, an activist for indigenous rights who won the Nobel Peace Prize in 1992, is perhaps the best-known K'iche'. According to the 2011 census, K'iche' people constituted 11% of the Guatemalan population. Accounting for 1,610,013 people out of a total of 14,636,487. The large majority of K'iche' people live in the highlands of Guatemala, notably in the departments of: El Quiché, which is 65.1% K'iche' and has a total K'iche' population of 622,163. 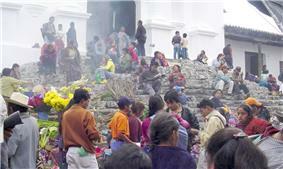 Totonicapán, which is 95.9% K'iche' and has a total K'iche' population of 453,237. Quetzaltenango, which is 25.9% K'iche' and has a total K'iche' population of 205,228. Sololá, which is 35.3% K'iche' and has a total K'iche' population of 151,992. El Quiché forms the heartland of the K'iche' people. In pre-Columbian times, the K'iche' settlements and influence reached beyond the highlands, including the valley of Antigua and coastal areas in Escuintla. Most K'iche' speak their native language and have at least a working knowledge of Spanish, with the exception of some remote and isolated rural communities. Maya languages closely related to K'iche' are Uspantek, Sakapultek, Kaqchikel and Tzutujil. In pre-Columbian times, the K'iche' Kingdom of Q'umarkaj was one of the most powerful states in the region. K’iche' was an independent state that existed after the decline of the Maya Civilization with the Classic collapse. K'iche' lay in a highland mountain valley of Guatemala, and during this time they were also found in parts of El Salvador. However, there is evidence for a large degree of cultural exchange between the K'iche' and the people of Central Mexico, and Nahuatl has influenced the K'iche' language greatly. The Spanish conquerors described towns such as Q'umarkaj (Utatlán), the capital of K'iche'. They bordered the Kaqchikel. The K'iche' were conquered by the conquistador Pedro de Alvarado in 1524. Their last military commander, Tecún Umán, led the K'iche' armies against the combined forces of Pedro de Alvarado and their Kaqchikel allies, in an epic battle in the valley of Xelajú (Quetzaltenango). The K'iche' armies were defeated, and close to 10,000 K'iche' died, including Tecún Umán, who has since lived on as a legendary figure in the K'iche' oral tradition. After the battle, the K'iche' surrendered and invited Alvarado to their capital, Q'umarkaj. However, Alvarado suspected an ambush and had the city burned. The ruins of the city can still be seen, just a short distance from Santa Cruz del Quiché. One of the most significant surviving Mesoamerican literary documents and primary sources of knowledge about Maya societal traditions, beliefs and mythological accounts is a product of the 16th century K'iche' people. This document, known as the Popol Vuh ("Pop wuj" in proper K'iche – "the book of events") and originally written around the 1550s, contains a compilation of mythological and ethno-historical narratives known to these people at that time, which were drawn from earlier pre-Columbian sources (now lost) and also oral traditional storytelling. This narrative includes a telling of their version of the creation myth, relating how world and humans were created by the gods, the story of the divine brothers, and the history of the K'iche' from their migration into their homeland up to the Spanish conquest. ^ Baily, John (1850). Central America; Describing Each of the States of Guatemala, Honduras, Salvador, Nicaragua, and Costa Rica. London: Trelawney Saunders. p. 83. ^ Coe, Michael D. (1999). The Maya (Sixth ed.). New York: Thames & Hudson. pp. 187–190. Note: List is ordered by decreasing size of population.